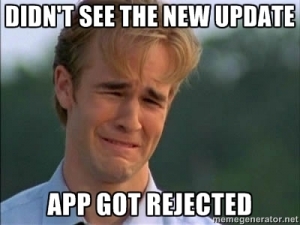 Many a developer has poured their blood, sweat and time into honing their precious mobile app project into perfection, only to get a vicious NBA-style rejection from the app stores. All that hard work and dedication, struck down by the nit-pickiness of the mobile giants. It’s an incredibly frustrating, yet all-to-familiar scenario for today’s developers, and one that can turn an app brimming with potential, into a mobile nightmare. App store optimization is a blossoming service right now, as businesses and developers struggle to get their app on smartphones as soon as possible. So how do you conquer the app store review? These app store submission tips can help hurdle the barriers and get your app into the spotlight. Possibly the most frustrating aspect of app store submission is the time it takes to review. The inconsistency can be particularly maddening. The iOS review process can take as few as 4 days, as many as 14, or anywhere in between. And that’s if your app gets accepted the first time. Google Play doesn’t take as long, but patience is still a virtue here. Unless you have an app store reviewer on your payroll, it’s a very good idea to plan for a lengthy review process, and hope for the best. Apple has a nasty habit of changing their acceptance rules frequently, especially after new OS releases. This can easily lead to a lot of app rejection headaches, so it is important to have someone keep on top of the latest updates. Ensure that you have someone who is continually familiar with the Apple Store and Google Play submission rules, and save yourself some hair. In every scenario for successful app developers, it all comes down to testing. From bugs to crashes, the list of app rejection reasons is ridiculously long. Common sense dictates that you test your app on the devices your reviewers will be using. This is one of the most essential keys to app success, in more than just app store submission, so do yourself a big favor. When you have built and tested your app to absolute perfection….test it again. Unlike individual developers, businesses don’t necessarily have to subject themselves to the verdicts of the mobile elite. Enterprise app stores are a growing trend in today’s mobile world, as companies are finding the capability to host and distribute their apps themselves, thereby avoiding getting lost in the ocean of apps that flood the Apple App Store and Google Play. If you have the means, this is a great way to make life easier, both for yourself and your future users. Can’t Get Enough App Store Submission Tips? There are few things more frustrating in this world than rejection, especially when you need your app in the stores quickly. If you’re hitting a review roadblock there is no need to despair. There is plenty of help out there. App marketing experts at MobileSmith have helped dozens of companies navigate the winding road to app store approval and ensure the app gets into the users’ hands. So don’t go crazy and throw your phone. With prior planning, and these app store submission tips, your app can find its way into the stores and start your journey to mobile success.